As we bid “goodbye” to the rains and step into much calmer and weather-friendly months of 2017, we can’t help but wonder where did the time whizz by? You must have already started making plans for major festivals such as Diwali – and if you haven’t then you must begin soon. Speaking of plans, have you had the chance to host a get-together in the open for your friends this year? If your answer is “no”, perhaps now is the perfect time to throw one! The weather is absolutely magical and we promise it won’t take much time for you to make all the preparations. Hear us out – organizing a social get-together in the garden or backyard is like attending a concert outdoors. It’s special! Gorgeous weather, close friends, good food and lots of laughter make it a memorable occasion. If you are convinced to invite your closest friends to your outdoor gathering, then here is a list of attractive ideas from our designers to help you to decorate your outdoors. Whether you opt for different tones of perky orange and pretty pink or majestic purple and chic green – the choice is absolutely yours. The idea is to create a warm and inviting space out in the open for you and your friends to enjoy. You have the liberty to create distinct yet equally appealing settings for your party. Decor tip: Don’t restrict yourself from picking just one palette. You can mix ‘n’ match colours and create a visually delightful space outdoors. If you plan to create a seating arrangement on the patio, you can simply place a spacious coffee table on top of a rug and throw in fluffy cushions for people to sit around the furniture. It’s simple and casual. Alternatively, you can lay down a light-weight dining table and a couple of wicker chairs for people to sit and have a meal comfortably. 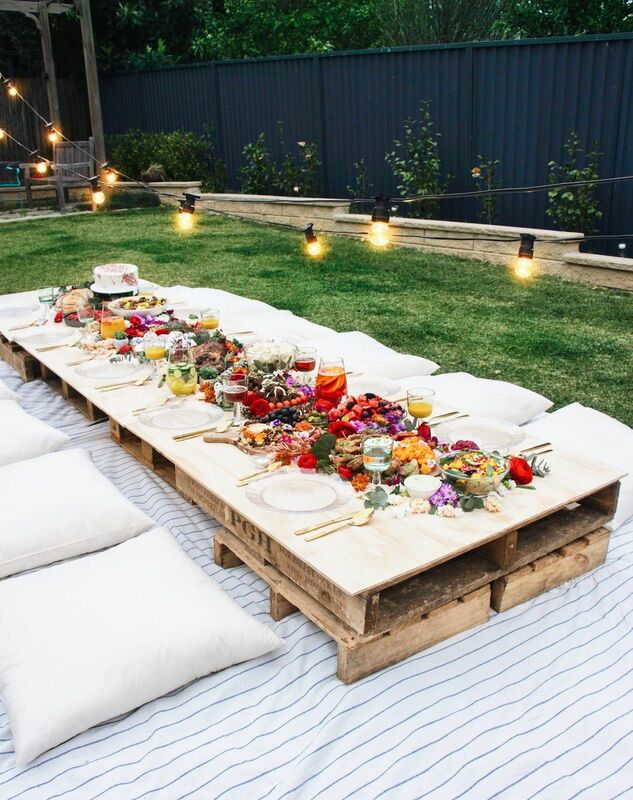 Decor tip: Whether you want to throw a party on the patio or right outside in the garden – make sure you plan properly. Please also keep a track of the number of people attending the affair to help you assess the furniture requirement. Walk the extra mile to make the space as comfortable as possible for everyone. Geometric designs are fun and playful, and spread a sense of cheerfulness in any setting. Outdoor parties are pleasantly casual. Therefore, select cushion covers, rugs and table linen in such designs. Geometrics complement rich and gorgeous colours; hence, make sure your furnishings are to the point. Mansionly has an attractive catalog of furnishings. Do have a look. Trust us – you will not be disappointed! Decor tip: If you are not a big fan of geometric designs, then go for florals or stripes. Spend some time to decorate your garden. Hang string lights or metal lanterns from the trees. Place alluring sculptures and huge pots of plants across the area. You can decorate your outdoors with adorable garden crafts such as pinwheels and paper dream catchers or origami creations – if time allows. Let your imagination soar. Decor tip: As far as the crockery and cutlery are concerned, please pick up something which complements the overall decor. 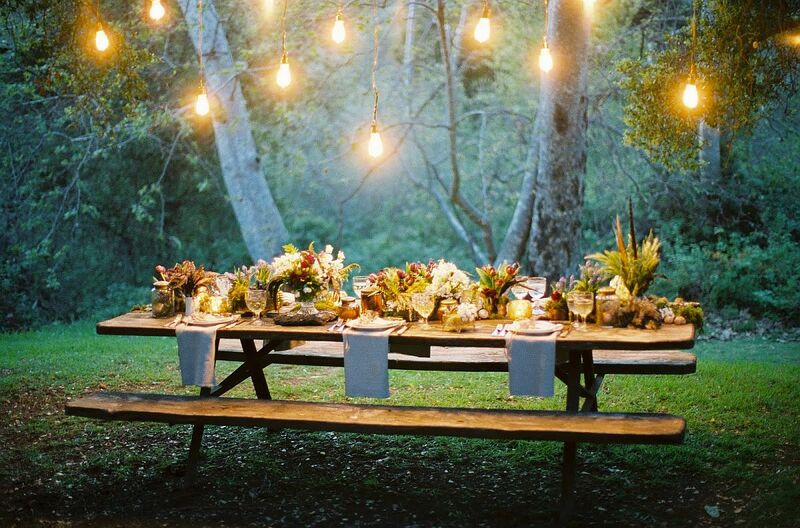 And if you are hosting a gathering at night, make sure the place is well-lit! We think flowers spread a happiness across the space – whether it is indoors or outdoors. As far as gardens are concerned, they are incomplete without pretty blooms and floras. When this is the case, why should your gathering be devoid of beautiful floral arrangements? Hydrangeas, carnations, pink roses and blue orchids are a few kinds of flowers that are extensively used in a decor setting. Place the flora of your choice on the dining table or any other massive furniture piece in the setting. Flowers will instantly perk up the place and make the surrounding look striking. Decor tip: Ensure the flowers you choose to decorate the area have greater longevity; they should look fresh until the end of the party. Please remember to keep the decor outdoors elegant but simple. Too many visual elements can kill the vibe of the space. Additionally, the space also becomes difficult to manage. Therefore, just keep it simple and have a great time!